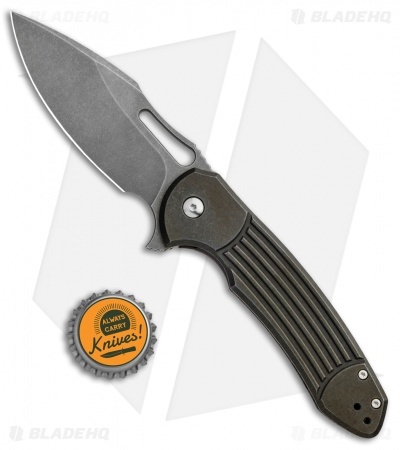 This Pro Series Fortis 2.0 has a bronze anodized "Bars" style titanium handle and a stonewashed blade. 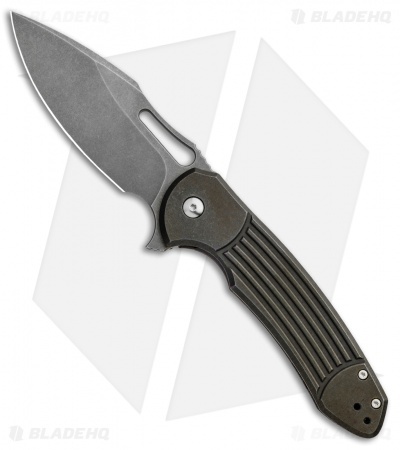 The Ferrum Forge Pro Series Fortis 2.0 takes inspiration from the original Fortis design, adds a few tweaks, and offers a far more accessible price point. 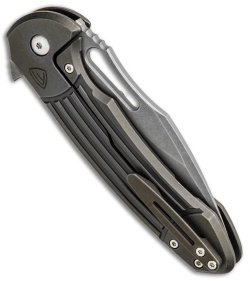 It sports an open-built titanium frame lock handle with an improved ergonomic shape and a reversible pocket clip. The S35VN blade is configured with a notched flipper tab and a stylized cutout for easy opening. 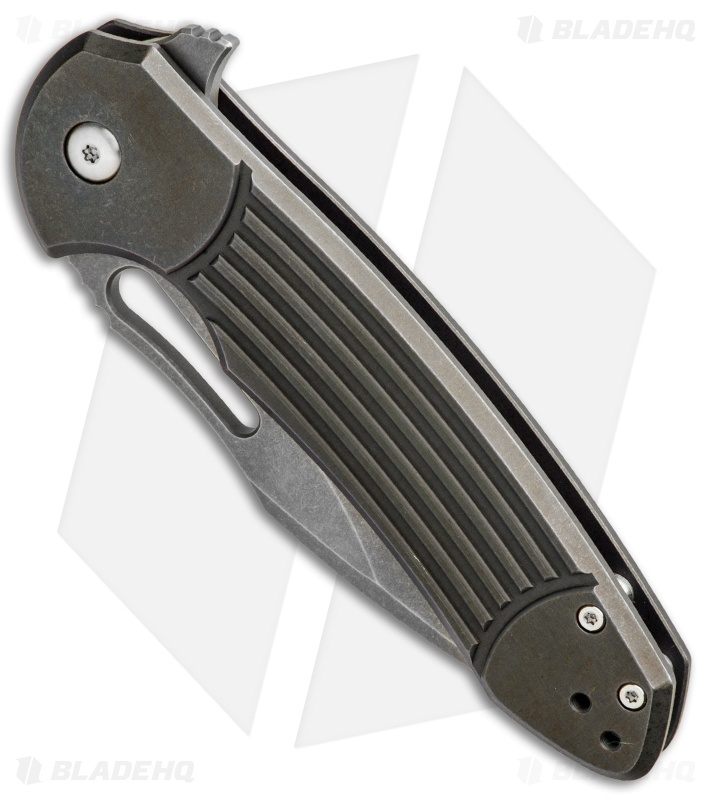 S35VN blade steel offers great edge retention wear resistance. Ball bearing pivot provides effortless flipper deployment. Machined titanium pocket clip allows secure tip-up everyday carry. I've been lusting after a Ferrum Forge knife for a couple years, so when they teamed up with WE for a less costly production line I was pretty happy. This arrived yesterday and out of the box it was fantastic all the way around. The quality is up there, if not better than higher end production knives like my ZT's. One thing to note, the detent is one of the strongest I've come across on a flipper, which is good as it allows the blade to rocket out similar to my automatic Kershaw Launch 7. It's that snappy. It does make spydie flicking a little more difficult until it breaks in. In fact, I did a side-by-side comparison of the detent ball to three of my ZT's, and could see a visible difference in the size and protrusion: much bigger. On lubricating out of the box: it has always been a normal practice for me to disassemble any new knife, clean it of any factory dirt/grease, and then sparingly lubricate the bearings, detent ball and detent path with lightweight oil. This practice has always worked out for me. However, I'm not convinced this was the right decision with this knife. And I feel like doing so may have actually made the knife's action..."stickier" in a way. Ferrum Forge has a disassembly video on YouTube for this knife. They only lubricated the detent ball and I feel like that may be the way to go. Let the bearings operate dry maybe. Either way, this is a beautiful, well-crafted knife all the way around and carries great. Buy it. You won't be disappointed.